Two (2) Real Estate Black Metal Lock Box with a nice removable metal cover front for easy key access and removal. This item is great for real estate agents, landlords, and even homeowners wanting to let contractors in when they are not home. The lock boxes have 4 digit wheels which include 10 numbers each. Unlike other letter wheels, there are 10,000 possible lock combinations for these boxes. Security: These are very heavy duty boxes for a secure place for key storage. These lock boxes can be reset with your favorite 4 digit code. When the front cover is removed from the box, there is a small switch that can be pushed down and to the right so that you can change the combination. There is no need to have an extra key that you might lose, or need to remember a second combination for these boxes, for you to remove them from the door handle. Quality: Unlike some of the other boxes on the market, these boxes are made of heavy duty metal. When the lock box is opened, it is easy to access the keys inside. You must struggle to remove the keys on some of the competition's boxes. Delivery: We know how frustrating it is to wait for an item that you have purchased for weeks. That is why we ship your order out as soon as the same day that you place your order. We package your item up as securely as we can to ensure safe delivery of your product. Cost: The cost of these boxes are well worth the money. 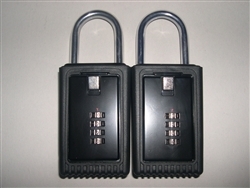 You are getting a high quality lock box at a great price. Due to the very affordable price, many agents and real estate professionals will leave the lock boxes on the door handle of the house after the sale to save their own gas money and time. We understand that your time is very valuable. We also understand that you want your items Good, Fast, and Cheap. We also understand that it must be all of the above.... Good (Your lock boxes need to be of the highest quality possible so that you are not embarrassed about not being able to operate it easily when you are showing a house to a client, or it falling off the door handle). Fast (When you need your stuff, you need it NOW! We understand this and ship items daily. Many times, your item will ship out the same day that you purchase it). Cheap (Let's face it, you are in business to make money, and paying top dollar for lock boxes is not at the top of your list of things to do as a professional. We understand this, and due to our volume of sales, we can offer you these lock boxes at a highly discounted price. We understand that purchasing lock boxes for your personal use or business use is a necessity and should be fast and easy. That is why we do our best to make our customers happy with the best products with top notch security, high grade metal quality, fast delivery, and at a low cost. Many of our real estate professional realtor friends use these boxes. Some of the possible uses may be to let contractors into your home when you are not there, real estate agents, real estate preservation, realtors, and landlords. We hope that we have given you enough information about ourselves and our products for you make an informed decision about our great products at great prices. We want you to succeed and want to help you so that you will come back. Reset Instructions: We have included the instructions below to show you that the lock boxes are quite user friendly to set. A set of instructions will be included with every lock box that we sell. We want you to know exactly what you are getting. Always make sure that you read all of the instructions thoroughly before resetting the combination digits for the lock boxes. The factory preset for the lock box is 0-0-0-0. 1.) With the preset code in place 0-0-0-0, push down on the silver button to open the box. 2.) Tilt the lid toward you while holding down the silver button to open the box. 3.) Turn lid over and push the silver switch down and to the right (follow the arrow on the back) to place in the reset position. 4.) Turn numbered wheels on the front of the lid to the desired code, verify the desired code is correct and release the set switch by pushing left up on the switch. 5.) The new code will now be set. 6.) To lock the shackle onto the door knob, push the silver pin inside the box to the right and hold. This will allow you to release the shackle. 7.) Place the shackle over the door knob. Push and hold the silver pin to the right and depress the shackle firmly into the hold and release the silver pin to lock the shackle in place. Test the shackle to insure it is locked, if not locked, repeat step 7 again. 8.) Insert keys in box and replace lid. Spin the wheels to lock box in place. 9.) We are not responsible for forgotten or incorrectly set combinations. For further help setting these combinations, or if you have any other questions about these locks, please email us. Each wheel on the lock box contains 10 numbers each. This gives you a full 10,000 possible combinations for these lock boxes! 2 Real Estate Black Metal Lock Boxes with a nice removable metal cover front for easy key access and removal.